Dr. John Hall grew up in Indianapolis. Among a family full of classical musicians, Dr. Hall played bassoon all through high school and on a music scholarship at the University of Florida. He received his Doctorate of Dental Surgery from the Indiana University College of Dentistry in 1977. Then he entered the United States Army as an intern in the Walter Reed National Military Medical Center’s dental facility, and completed a general practice residency in 1978. Dr. Hall entered private practice in Sarasota in 1980 and opened our current location in 1986. 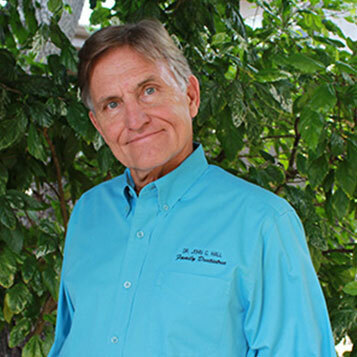 Dr. Hall has lived in Sarasota since 1980 with his wife Tippie, a licensed massage therapist. They have two sons; John graduated Full Sail as a sound engineer, and Evan works as a finanacial trader with Global Financial in Sarasota. Dr. Hall spends his free time pursuing an active lifestyle. He loves to enjoy the beauty of Florida, whether he’s on the water or on his paddleboard, playing golf, diving, fishing, or just riding a bike on the beach. Visit Dr. John Hall on Google+.